At Healing Gemstone Jewelry, the focus is on providing quality and authentic gemstone healing jewelry with the highest levels of customer satisfaction – I will do everything I can to meet your expectations. With a variety of offerings to choose from, I'm sure you’ll be happy working with me. Look around at my website and if you have any comments or questions, please feel free to contact me. My hope is that you will be so satisfied with your jewelry, I will see you again! Check back later for new jewelry pieces and unusual gemstones. There’s always something new! This is me using my little macro torch while soldering a chain together. All of my jewelry is one-of-a-kind pieces, made one at a time. I also love doing custom work and getting feedback from my customers as I make their new friend. I have been fascinated and drawn to gemstones for as long as I can remember. I began using them in my Reiki practice during healing sessions, to help move energy. Then I decided I had to learn to make jewelry so the stones can be worn and the wearer can receive a healing all day every day for as long as they needed it. This was a decision I made 18 years ago. Being a lifelong craftsperson/artist, I got deeper and deeper into the whole jewelry making process and today I think one could say I'm obsessed. 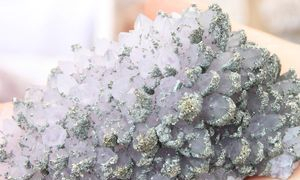 It's incredibly fulfilling to take beings like gems and make beautiful settings to place them in, so that they look outstanding on the person as well as make the person feel awesome. I feel really blessed to be able to do this. I also love that the stones can be attuned to give the wearer a Reiki treatment if they desire for as long as they need it. I study stones and their healing properties. Before I purchase the stone I make sure the stone is what the dealer is telling me. I must make sure the stone is real, natural, and good energy because it's a healing stone, not just a pretty face. My background is: I'm a Reiki Master and hold certificates in Holographic Repatterning, Reconnective Healing, Holistic Animal Care, Animal Homeopath, and Homeopathic Facial Analysis for humans and animals. I have attended many different classes in Herbs, diet and nutrition, growth counseling, touch for health, Flower Essences, and many others. My joy and passion is healing and creating with my hands.